Dwarf hamsters can—and should—eat a variety of different foods for their balanced diet. Unlike Syrian hamsters, dwarf hamsters are at a high risk of diabetes and need special diets to make sure their blood sugar level stays in check. Because dwarf hamsters are very prone to diabetes, they can't handle the same foods as Syrian hamsters. Many commercially available kibble formulas have ingredients that can upset the delicate balance of your dwarf hamster's blood sugar levels. Fruits, sweets and refined products shouldn't be fed to these little guys. 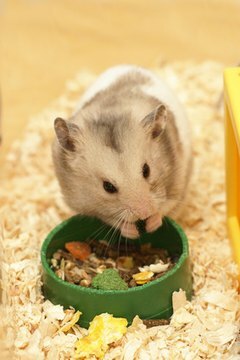 Vegetables are among the safest, healthiest treats to feed to dwarf hamsters in addition to a well-balanced kibble formula. As with humans, many colorful or dark-colored vegetables provide necessary nutrients and vitamins. Green leafy Romaine or other lettuces are ideal, as well as spinach leaves. Broccoli, cauliflower and kale are crunchy additions to his diet. Other examples of healthy vegetables include cucumbers, celery, red and green peppers, bok choy and sweet potatoes. Beans and legumes are also an acceptable treat. Nuts and seeds are OK, but feed sparingly, as they have high fat content. While it may come as a surprise, dwarf hamsters need their protein and will eat several different meat, fish and other proteins. Vegetarian options for protein include spirulina and seaweed, roasted soybeans, flaxseed and tofu. He'll also benefit from boiled chicken, canned and drained tuna, boiled chicken or turkey, cooked egg whites with small amounts of egg yolk and unseasoned poultry baby food. Some dairy products are OK in small amounts, such as low-fat plain yogurt and unprocessed cheeses. Whole grains are ideal as a snack and as an addition to a balanced meal. Cooked pastas, whole wheat toast and cooked whole-grain rices are ideal snacks as long as they are cooled completely. Whole-grain unsweetened cereals also provide a healthy snack while giving your dwarf hamster something crunchy to gnaw on. Carrots, corn, fruit, white rice and white bread should be avoided because of the high sugar content. Sugars, including maltose, fructose or dextrose, should also be avoided for dwarf hamsters. Other foods to avoid are potatoes, raisins, sprouts, garlic and onions, because of the risk of toxicity.